Painful breasts may be very common, but that does not mean it is normal to have breast pain. Painful breasts are NOT just part of being a girl, your breasts are trying to tell you something. They are crying out for some changes to be made. So give ‘the girls’ some attention and extra loving by following the suggestions below. The role of diet, lifestyle changes, and topical treatments for treating breast discomfort may not be medically ‘proven’, but women have reliably benefitted from the suggestions below. 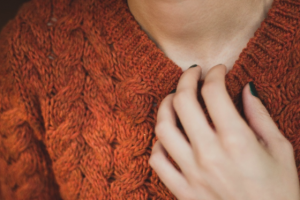 For myself, I used to have horribly fibro-cystic breasts, lumpy, bumpy, dense and painful….to the point where I didn’t want to hug people because it hurt too much. I can happily say that due to the suggestions below, my breasts are pain-free, happy, and I LOVE hugs! Eat fiber. Flax and leafy greens are a great source of fiber. You can take 2 Tbsp. of freshly ground flax seeds a day. They can be added to smoothies, vegetables, fruit salads, grains. For some, it may be helpful to rehydrate flax seeds (let soak in water for one hour before using), or take lots of water with them. Do not cook flax seeds. Flax helps your bowels, and helps to eliminate estrogen. Magnesium Citrate, 120 – 1200 mg daily can help to achieve soft but firm stools. Eat your greens – kale, collards, broccoli, Brussel sprouts, broccoli sprouts. These contain chemicals to help detoxify estrogen and the fiber helps you to clear estrogen out of the body before it is absorbed. So, eat your greens. Drink some bitter tea 20 minutes before a meal. This increases your digestion and absorption, nourishes your liver and supports it’s ability to detoxify. Some choices are artichoke, dandelion root, turmeric, milk thistle. Some supplements that would be beneficial are Herbalists and Alchemists Bitters Compound and Thistles Compound, and Liver Cleanse by Gaia Herbs. Any clothing that presses against your skin with more than the weight of a nickel can impair lymphatic flow. Tight jeans may look good, but they are not good for you. The girls deserve good support, but not at the expense of good lymphatic flow. Make sure your bra fits properly, is not too tight, avoid underwires if possible (they restrict lymphatic flow), and let the girls go free and give them a good rub when you take off your bra. Look at side effects of Rx medications. Smoking can contribute to breast pain, as well as increase the risk of cervical cancer. Water with lemon taken first thing in the morning can help your body to eliminate excess hormones. Many women are very sensitive to the hormone disrupting effects of caffeine. Caffeine interacts with enzymes in the breast, exaggerating pain and lumpiness. Even a couple cups of coffee a week wreak havoc. If that’s the case for you, try green tea instead as the caffeine in green tea seems to interfere less with hormone balance. You many need to eliminate caffeine altogether. Sorry, this includes chocolate! Alcohol increases estrogen and is linked to the development of breast cancer. Dairy is very inflammatory and can cause lots of mucous production. Eliminate dairy completely for 3 months and see if this helps. If it does, keep it out of your diet. Avoiding foods that are inflammatory, such as sugar, dairy, gluten, corn, and soy. Turmeric is a fabulous herb for reducing inflammation. It should be taken with a little fat to increase its bio-availability. Eat less animal protein – animal protein is more inflammatory than vegetable protein (beans, legumes). Deep-sea fish is also low inflammatory – choose varieties low in mercury. Eat good quality fats such as organic coconut oil, extra virgin olive oil, walnut oil for cooking, and organic flaxseed oil for dressings. Iodine deficiency can contribute to fibrocystic breasts. The best way to take iodine is to eat seaweed, or sprinkle seaweed on your food. Some multivitamins contain iodine. Get your thyroid tested. Low levels of thyroid hormones have been shown to boost estrogen in breast tissue. A full thyroid panel consists of testing levels of TSH, free T3, free T4, Thyroid anti-bodies, and reverse T3. Herbalists and Alchemists Burdock/Red Root Compound can help to enhance normal elimination and reduce lymphatic stagnation which can help to reduce cystic breast symptoms. Apply castor oil packs over the breast. Pound/smash leaves, make poultice, apply topically. Leave on till get too warm from body heat. Apply Herbalists and Alchemists Poke Root Oil topically to the breast. Do not do this if you are breast feeding. Anything suspicious should always be checked out. Some breast pain symptoms that could mean breast cancer include breast pain associated with a rapidly progressing tender, firm, enlarged breast. The skin over the breast may be warm and feel thick, with an orange peel appearance. If you have any sudden and new breast symptoms or pain in one local area, go ahead and see your doctor. Disclaimer: It is your constitutional right to decide how you wish to care for the health of your body. The statements in this newsletter are intended for educational purposes to provide information to help you choose the best possible path to your natural state of wellness. These statements are not approved by the FDA, and Jennifer O’Hagan, RH(AHG) is not a medical doctor and does not diagnose, treat or prescribe remedies for the treatment of disease. All information provided is for educational purposes and does not replace your medical doctor. I encourage you to seek medical advice and evaluation for your health issues.